The Histogram is a brightness graph - left side is darker values, right side brighter. Use it to judge the overall balance of exposure in your image. Determining where your exposure is balanced is simple with the Histogram- if a 'lump' is shifting more to the left, more of your image is in shadow, if a 'lump' is towards the right, your image is largely in highlight. One quick glance of the Histogram is enough to determine the overall exposure balance of your image -- not fine details about it but a general gauge of where most of your image is 'weighted'. Beyond determining exposure balance, the Histogram is outclassed in utility by the other exposure aids that are more suitable for pinpointing specific issues on the image. For the most versatile scope for most setups, have a look at the Waveform. The Histogram is a good low-profile scope as it doesn't generally lose any utility by being scaled down and mostly out of the way. In this section we will add a Histogram to a page and use it to set exposure. 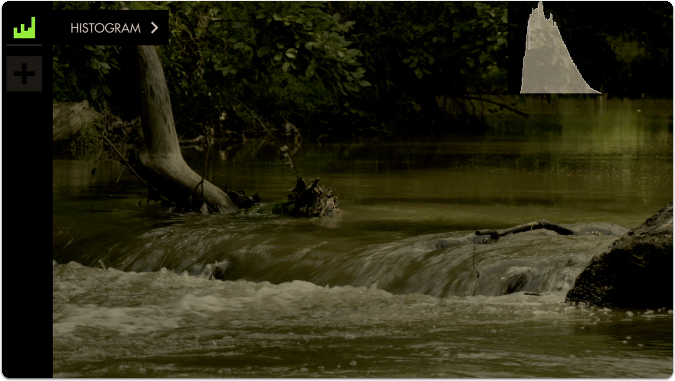 Navigate to Scopes > Histogram and select the '+' to add it to the current page. A graph appears in the top-right of the image. The overall 'weight' of the image data is positioned towards the left of the graph; this is telling us we have a lot more shadow areas than highlight areas. Since this is a daytime shot with relatively even light (no super-bright objects) we can roll exposure to better balance the 'lump' of the graph toward the center. There are no 'spikes' toward the far-left or far-right of the graph, meaning everything in our shot is within a usable exposure range and as a result no clipping is occurring. 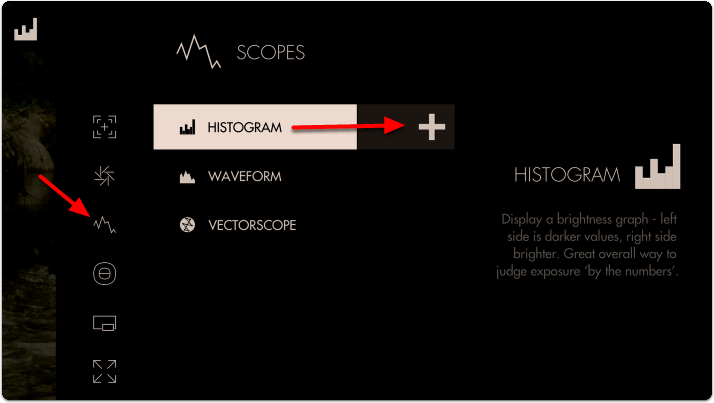 Let's edit how the graph appears by navigating right or tapping the arrow when ‘Histogram’ is highlighted. For a bit more useful info you can navigate to 'STYLE' and set from LUMA to RGB to get access to color information in addition to luma/value. 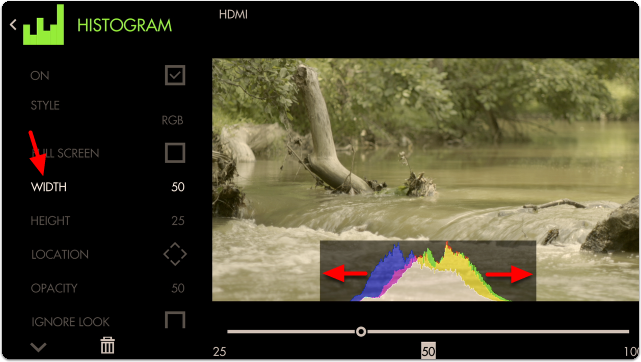 Just as with Waveform, using RGB mode lets you see the individual luma values of red, green and blue that make up your image - If you see a distinct separation of colors on the graph you will notice more colorization/saturation. To adjust the position of the Histogram to arrange with other tools or for better general visibility, alter the LOCATION and use the joystick or tap around the screen to place the graph. With the addition of RGB data, we can tell that our image has a warm cast toward the brighter end (yellow area) and a cooler cast in the shadows (blue area). Cameras which have an 'auto exposure' will often use an internal histogram as their guide, meaning it will center the 'weight' on the graph as best as possible just as we are doing here manually. 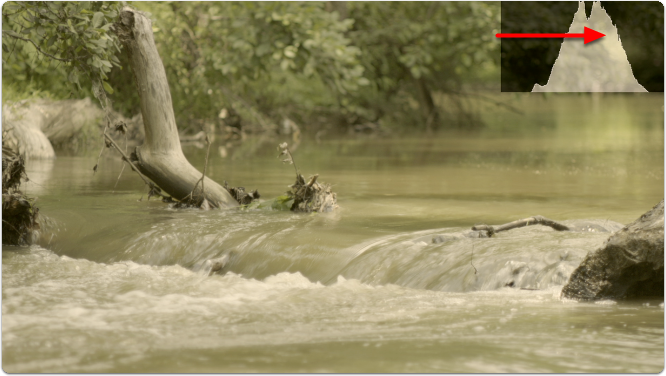 Because the Histogram does not know the context of your shot it can sometimes be tricky to use for exposure balance. For example a brightly lit snow scene will weigh heavily on the right but if we roll exposure to center the 'lump', the whole scene will then be too dark, because brightly lit snow should appear brightly lit. Conversely if you are shooting a subject under a spotlight but against a dark background, the Histogram may appear as if you have an underexposed image if it's reacting to the dark background. For these cases we recommend the Waveform, Exposure Assist or Zebra as they can report issues from discrete portions of the image. Access Histogram tool settings menu by navigating right or pressing the right arrow when Histogram is highlighted in the tool list. 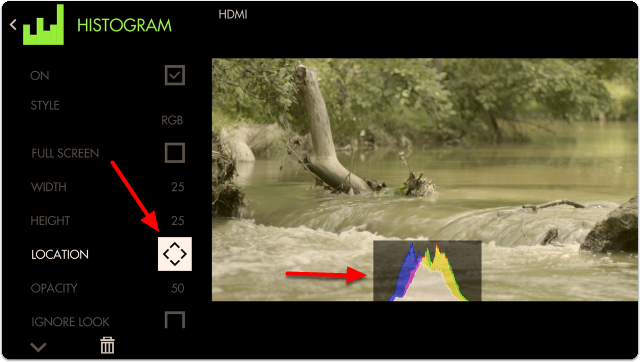 Pick your flavor of Histogram- LUMA displays a brightness/luma plot only while RGB graphs red, green and blue values individually for a look at the chromacity of the image. Displays the histogram in a full-screen view, which is useful when viewing from a distance or if using multiple monitors where another can be displaying the image itself. Scales the Histogram horizontally to help with rearranging your workspace. Set the location of the Histogram to a spot of your choosing - useful when placing multiple tools/scopes on screen. Adjusts the transparency of the black background behind the Histogram for readability. Boosting Intensity helps to compensate for a lower Opacity. Because monitoring with a Look (3D LUT) alters the image and therefore its exposure, it can be useful to ignore its effects on exposure tools. 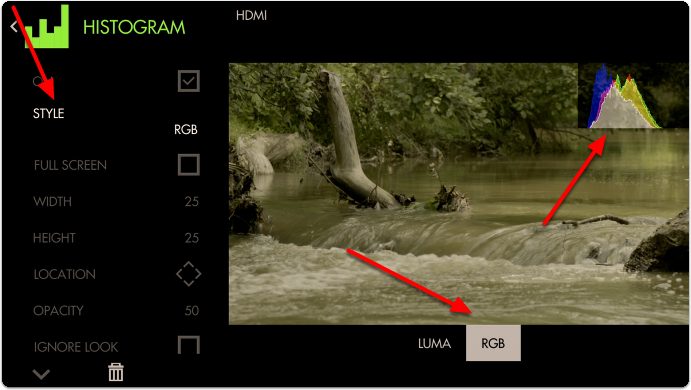 This means you can monitor with any graded Look while using the Histogram to set up your camera to be exposed properly for any other grading possibilities in post because it’s working off the camera’s original ungraded image. We recommend leaving this on for most shooting scenarios unless you are baking a LUT into your footage on set and do not intend to color grade in post.